Offices double as examination rooms at the health center currently. Relocation to a newer building could allow for a more practical use of space. A 1920s facility, Dudley Coe is finding it difficult to keep up with the growing needs of the student body in its current location. With more Bowdoin students on prescription medications than ever before, according to College Physician and Director of Health Services Jeff Benson, and the health center diagnosing and treating increasingly more serious conditions, Benson is pleading for a renovated college health center?one that is, at the very least, handicap accessible. The anticipated location for the new health center is Jewett Hall, which is adjacent to Thorne Hall and currently houses an electronic music lab and several administrative offices. "The problem with Dudley Coe is that structurally and architecturally, it's a very difficult building to renovate," Benson said. According to Benson, a new facility would not necessarily mean more staffing, but rather, more efficient patient flow. At most medical facilities, each physician has multiple examination rooms in addition to a separate office in which test results are given. 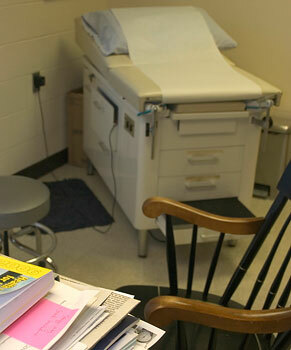 In Dudley Coe, however, each practicing staff member's examination room doubles as his or her office. This limits each staff member to seeing one patient at a time, even when waiting for test results. The health center has seen increased patient flow since implementing limited weekend hours starting November 20 that are scheduled to continue until Spring Break every weekend while classes are in session, costing Dudley Coe a total of $2,000. Dudley Coe saw twelve students the first weekend and eleven the second, and 90 percent of the visits were "entirely appropriate" and should not have waited until Monday, according to Benson. "People have real medical needs and it feels good to be able to take care of them," Benson said. "No matter what the financial situation is, it's really hard to argue with $2,000." A new facility would also provide the opportunity to offer physical therapy. Benson proposed the idea of a new health center facility at the most recent Board of Trustees meeting in October. "The importance of the meeting with the Trustees was to broaden awareness of the full range of illnesses and diseases that undergraduates at Bowdoin face that are diagnosed and treated at the health center," Dean of Student Affairs Craig Bradley said. "A new health center facility is a well-understood need in terms of campus planning," Bradley said. At his presentation before the trustees, Benson shared the results of an informal study he conducted, in which he pulled every eighth chart of first years and seniors until he had 50 from each of the two classes. He then compared the number of students from each class who were on prescriptions (not including birth control) upon arrival at Bowdoin to see whether students entering college today are on more medications than those who entered college three years ago. Of the 50 students used in the informal study, there were eight members of the Class of 2006 on two or more prescription medications on arrival compared to 13 current first years, four members of the Class of 2006 on psych medications on arrival compared to six current first years, and ten members of the Class of 2006 on "significant medications" on arrival compared to 12 current first years. Benson says this shows that students today are entering college on more prescriptions than they were three years ago. "I'm not sure if it's statistically significant, but it's suggestive," Benson said. Many of the medications prescribed between freshman and senior year are prescribed through the health center, rather than through family prescriptions, according to Benson. Members of the Dudley Coe staff agreed that the most commonly prescribed medication at the health center is birth control, by far. "For all of last school year and this semester so far, we've dispensed from our formulary 3,288 packs of OCP's (oral contraceptive pills), 972 Nuvarings (vaginal contraceptive rings), and 672 packs of Plan B (emergency contraception)," Benson said. These prescriptions are free of charge to students and not included in counts of written prescriptions. After birth control, the most frequently prescribed medications are chronic prescriptions, such as anti-depressants, acne medications, asthma medications, and acid-suppressants, in that order. A number of serious health concerns were also treated at the health center last year as well, including chronic active Hepatitis B, Crohn's disease, Type 1 Diabetes, and malignant tumors. "I wanted to focus the trustees' enthusiasm to support certain things?to show that college health centers aren't just for runny noses and sore throats," Benson said.